There exist many definitions and interpretations of the “welfare state”, and scholars have over the last 50 years or so offered a number of more or less competing conceptualizations and typologies or “models” of welfare states based on various criteria or specific combinations of criteria. One such type or model of welfare states to be distinguished among Western welfare states is the “Nordic welfare model”. Much has been written about the Nordic welfare states. This paper tries to pinpoint what the author claims can be considered the main characteristics of the welfare state of the Nordic type. Many aspects of the Nordic welfare states are shared with other welfare states. It is not one feature, but a specific combination of features, which can be said to define and justify a concept of a Nordic type of welfare state. The combination of features makes the similarities between the group of Nordic welfare states (i.e. Denmark, Finland, Norway and Sweden, while Iceland is slightly different) greater than similarities between any of the Nordic countries and other European or Western welfare states. As other European and Western countries, the Nordic countries are all democratic, capitalist market-oriented economies with a substantial—and varying—emphasis on social and welfare policies. Some kind of “welfare state” exists in all Western countries, and the scope of public welfare effort is, with very few exceptions, larger in European countries in general than elsewhere in the world. What can be said to put “the family of” Nordic countries apart from other Western countries is that their welfare states with “Nordic characteristics” combine the normative foundation of strong public responsibility for citizen welfare, the principle of universal population coverage, adherence to social equality, with specific formal and informal mechanisms through which social policies are developed and politically agreed upon. The paper briefly also comments on and emphasizes the role of long-term cooperation between the five independent Nordic countries. 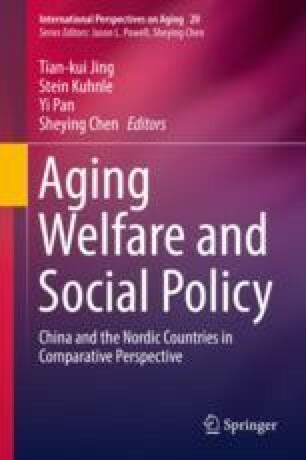 The paper was originally presented at the International Seminar on Ageing Welfare and Social Policy, 20–21 June 2015, Chinese Academy of Social Sciences, Beijing.